A court interpreter is an expert in language interpreting for legal proceedings. 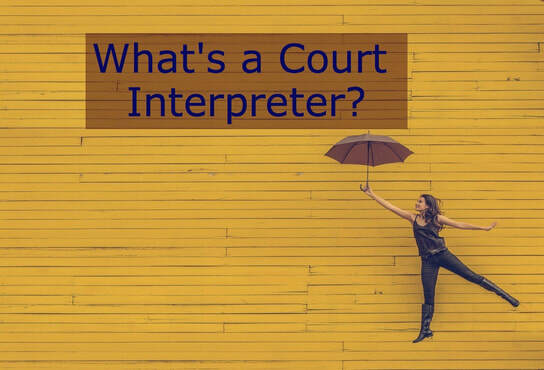 Also known as a certified court interpreter, this is a specialized field. Most states, if not all, require certification for all services performed in court or any legal proceeding outside the courthouse.The certification process consists of a written exam. After passing said exam, the candidate is able to take the oral exam. Not all languages are certifiable by the courts. Check with your state to find out the requirements for the language you are seeking. Not everyone that says he/she is certified is a certified court interpreter. The only valid certification is one issued by a government entity, such as state and federal courts. Most state courts use the National Center for State Courts to administer that court interpreter examination. ““The Court Interpreters Act, 28 U.S.C. §1827(link is external) provides that the Director of the Administrative Office of the United States Courts shall prescribe, determine, and certify the qualifications of persons who may serve as certified interpreters, when the Director considers certification of interpreters to be merited, for the hearing impaired (whether or not also speech impaired) and persons who speak only or primarily a language other than the English language, in judicial proceedings instituted by the United States.